My task list has had a bit of a snowball effect, in that these minor transformations have been fueling my motivations as our kitchen makeover looms. On the ground level of the split, and sandwiched between our kitchen and garage, is our entry. I don't have anything grand planned for the space. In the interest of full disclosure, this narrow foyer is used more as a bag drop, collection spot and shoe area more than anything else. This is a photo of the in-progress. 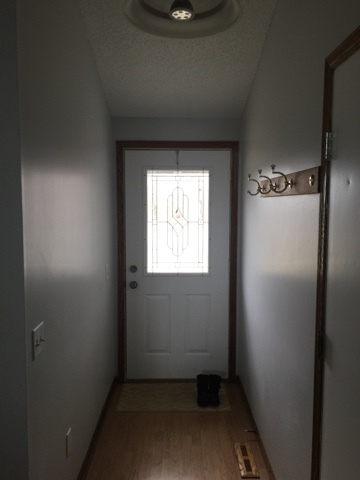 The gray walls replaced a beige paint color, the ceiling got a coat of white paint and we painted the existing door white as well. The switches and outlet covers have also been replaced with white ones. 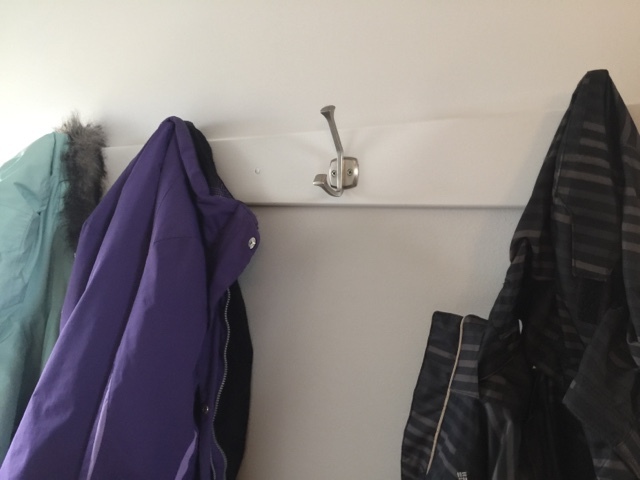 I love that coat rack. It saves space and is completely functional. After we finished the bathroom and linen closet, I moved forward to our entry to begin this small project. I taped around it, removed the hooks and began to strip the sheen off the wood surface. 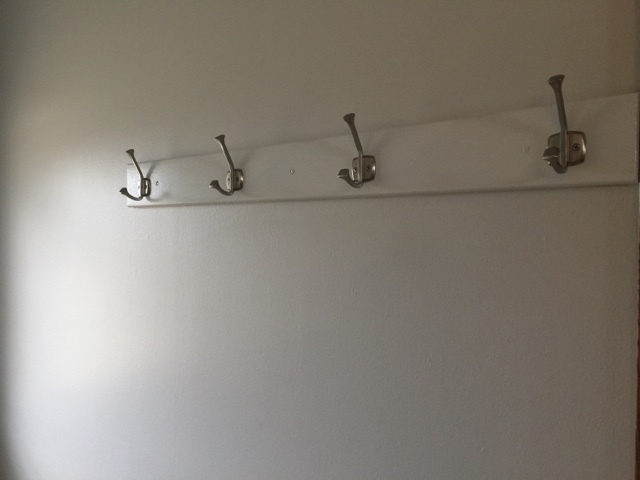 This strip of wood would receive the same treatment as the linen closet, and since I had plenty of supplies left over, the budget was practically non-existent. Though it may not seem like much, that wood piece still required an entire weekend to properly refinish. I also appreciate the fact that posts of this nature are probably more for my benefit than others', since I pull a lot of motivation to keep going when I review these transformations. Next up is flooring, trim and baseboards. We will be purchasing a new floor vent too.